Rackets, rackets and more rackets. Of every size, weight and color. Strung and unstrung. Hanging, propped, shelved and displayed everywhere the eye can see. Up, down and all around. Literally. 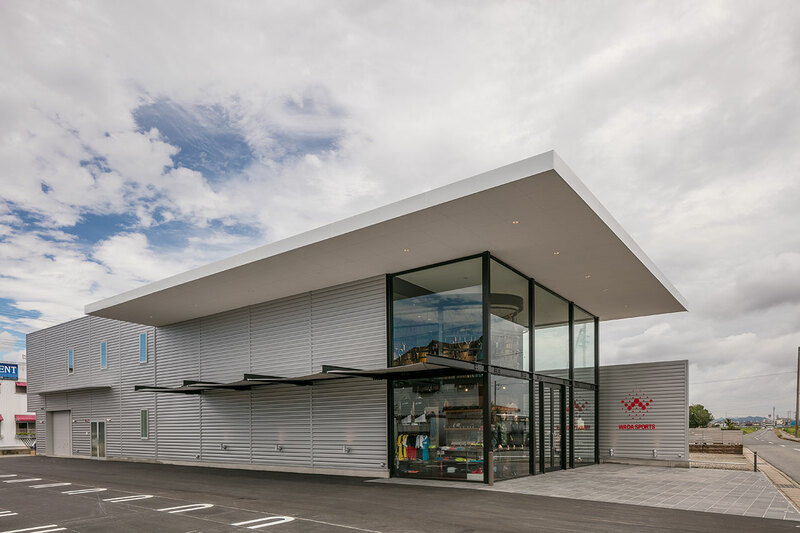 Upon entry, recognition is instant regarding what exactly WADA Sports' new headquarters and flagship store in Himeji, a city in the Kansai region of Japan, is showcasing. 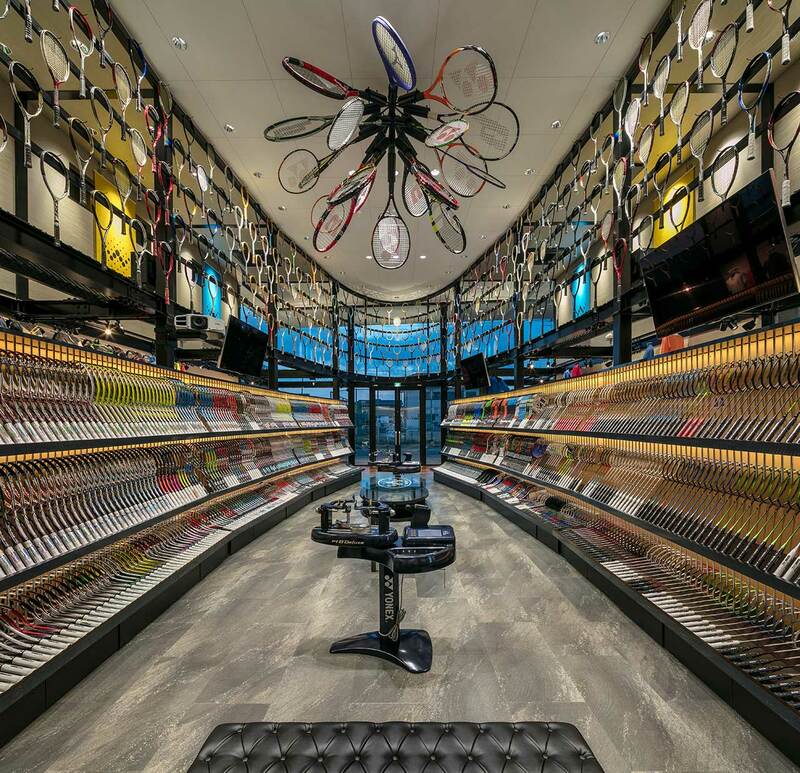 In fact, Matsuya Art Works/KTX archiLAB and lead architect, Tetsuya Matsumoto, have created a tennis-lover's dream store. This is where the party begins. The 412 square meter interior is overtaken (in a good sense!) by a gigantic, elliptical metal structure in its very center, which has both an architectural as well as a stylistic role. 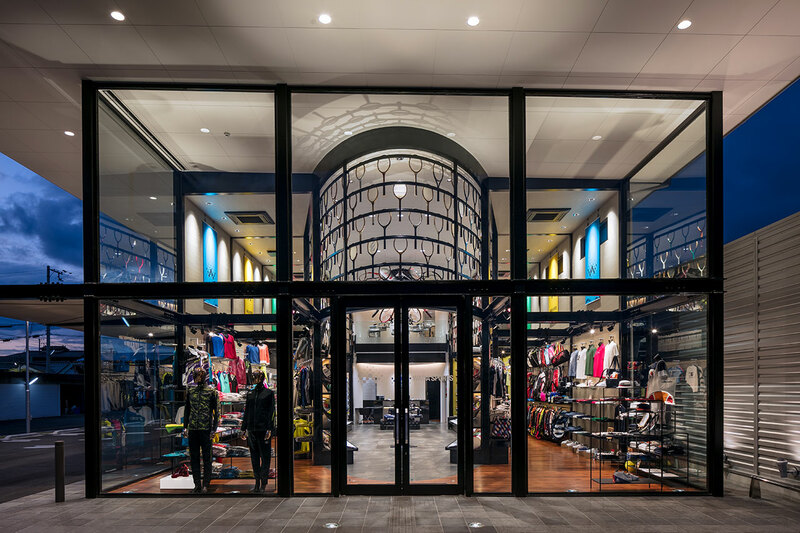 On the one hand, it supports the entire building with its frame, and on the other hand, is the main design fixture utilized to show off those hundreds (or maybe thousands?) 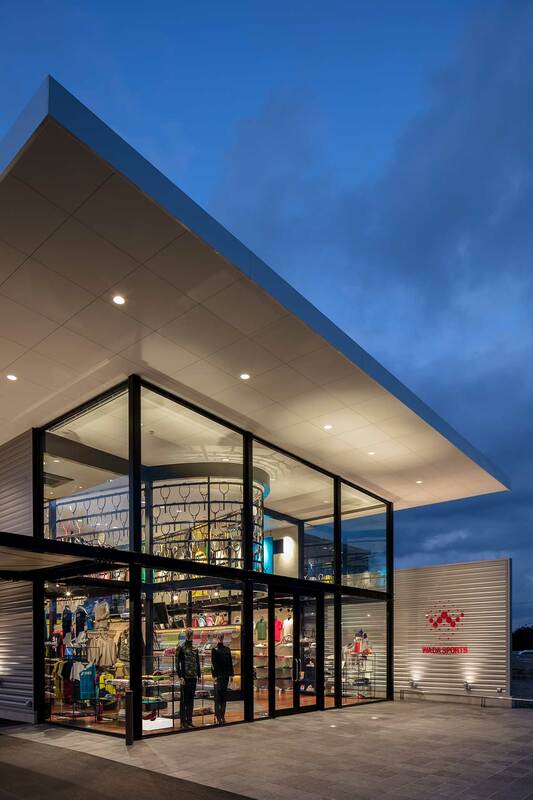 of aforementioned tennis rackets in WADA Sports' repertoire. 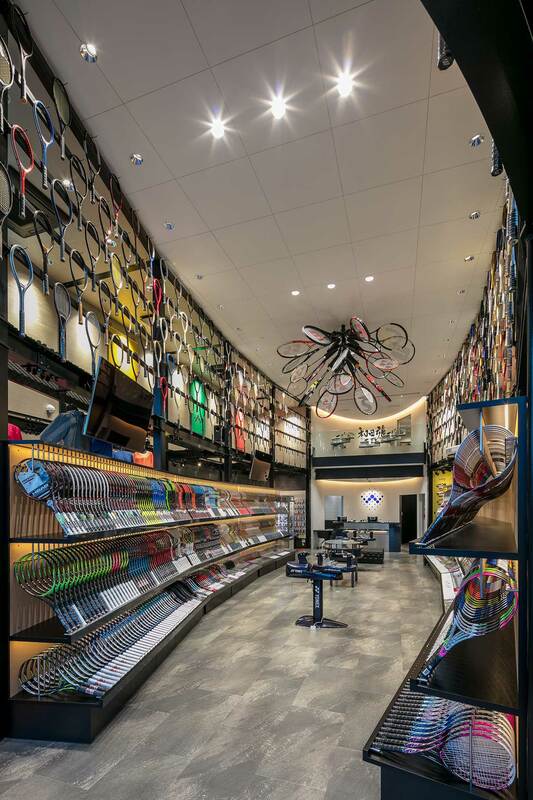 Other than being very eye-catching, the display makes it easy for customers to pick up the rackets and test them out, to feel their weight and thickness in their hands and select the best one for them. 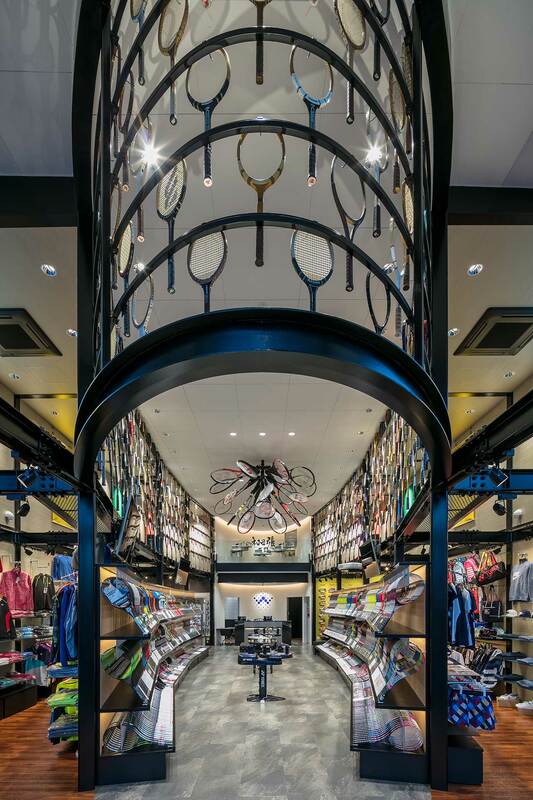 Not only that, but hanging like chandeliers from the ceiling as well as from the highest parts of the elliptical display there is a showcase of valuable rackets that have been collected from all over Japan - from vintage wood rackets, to rackets used by famous players. A living museum, if you will. 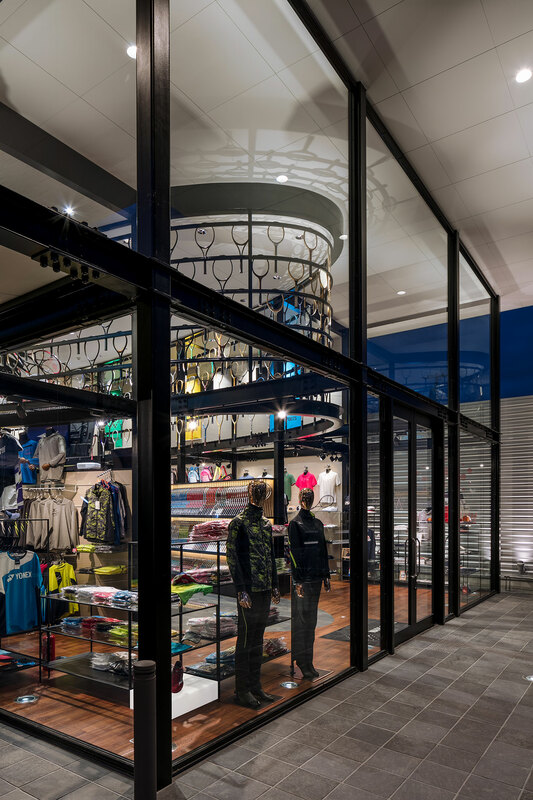 Meanwhile, garments, shoes and other tennis-related accoutrements are displayed in the area surrounding the elliptical racket display, making it a one-stop-shop for anyone looking to improve their game... and look like an ace on the court while they do!